The Commonwealth is full of beautiful stories. From Hinemoa and Tutanekai to Romeo and Juliet, there is a story for everyone … and a story in everyone. Our four-anthology series A River of Stories (AROS) takes some of these stories and aligns them with the four elements; water, earth, wind and fire. The AROS anthologies encourage students to reflect on the importance not only of the natural world but also of working together across their communities, the Commonwealth and beyond to achieve environmental and social sustainability. Here are four reasons why you should make sure A River of Stories winds its way into your classroom. An appreciation for nature must be developed early in order to empower young people to take action to prevent Climate Change. Just this month, experts at the UN Intergovernmental Panel on Climate Change (IPCC) have warned that there are just 12 years left to curb the devastating impact of Climate Change. Using AROS in your classroom will show your students the beauty and diversity of the planet, allowing you to demonstrate the need for action in a creative way. There are a wide range of teaching resources that are free to download. As well as illustrating the diversity of the natural world of the Commonwealth, AROS also reflects the many different peoples of the 53 nations. Learning about all of these different cultures will give your students an appreciation for the differences among us all. Encouraging identification of similarities, as well as unique qualities, will encourage respect both inside and outside of the classroom. The AROS series is beautifully illustrated, with vibrant images that bring the stories to life. As we grow older, our books often lose their colour – use this opportunity to bring back the magic of an illustrated story and foster an appreciation for different types of artwork. The pictures themselves can prove an important tool for sharing more about the Commonwealth and its diversity. Above all, the AROS anthologies are simply good stories that evoke the atmosphere, warmth and beauty of the Commonwealth, both social and natural. Teaching AROS is a great way to share special stories with your students. And who doesn’t love a good story? 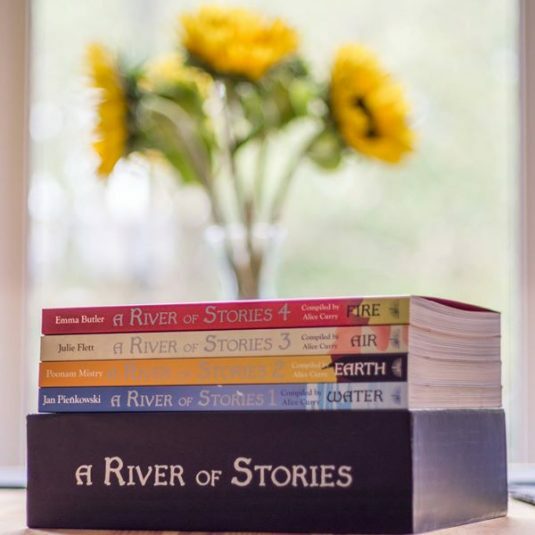 Are you inspired to make A River of Stories part of your literary repertoire? Like us on Facebook or follow us on Twitter and share the pinned post for your chance to WIN one of five sets of the series. For more ideas and resources, visit our Children’s Literature page.